The carrot is a root vegetable that grows in the earth. It is usually orange in color, though it can be in other colors like purple, red, white, and yellow. The carrot is a root vegetable that grows in the earth. It is usually orange in color, though it can be in other colors like purple, red, white, and yellow. The carrot is native to Europe and southwest Asia and is used in many regional cuisines. Carrots can be bred and cultivated to be sweet, crunchy, and aromatic. Due to the high content of nutrients in carrots, this popular vegetable contains many health benefits. Carrots can improve one’s digestion due to its excellent source of dietary fiber. Eating dietary fiber can prevent constipation and help the body remove body waste products, while maintaining healthy blood sugar levels too. Individuals with diabetes strive to have a stable blood sugar level. The dietary fiber content in carrots can help prevent blood sugar spikes and crashes, which can be fatal to individuals with diabetes. Carrots can help improve one’s blood sugar levels because of the antioxidant carotenoid. Carotenoids help decrease insulin (a hormone that helps body cells absorb sugar) resistance and blood sugar levels in a stable way. The antioxidants in carrots not only fight diabetes, but also battle against various types of cancers. The beta-carotene (what the body uses to make vitamin A) found in carrots has been associated with a reduced risk of several cancers. Beta-carotene is a strongly colored red-orange antioxidant abundant in carrots. A medium-sized carrot contains roughly three milligrams of beta-carotene. Researchers have suggested that increasing beta-carotene consumption to 2.7 milligrams per day reduces lung cancer risk by more than 40%. It is known that there are several essential vitamins in carrots. Vitamin A is known for improving vision and preventing night blindness that may develop as we age. Carrots are rich in vitamin A with 428% of the recommended value per serving. Also, vitamin A has been known to keep the hair moisturized through increased sebum production. This helps protect the hair and keeps frizz at bay. Also, adequate vitamin C intake can create and maintain collagen, an important protein found in the hair and skin. Collagen is very important because it holds the skin, tendons, and ligaments together, without which the body would fall apart. A study from the Wolfson Gastrointestinal Laboratory in Edinburgh, Scotland suggested that cholesterol levels drop by an average of 11% when seven ounces of raw carrots per day are taken for three weeks. For individuals with heart problems, carrots help improve blood pressure. 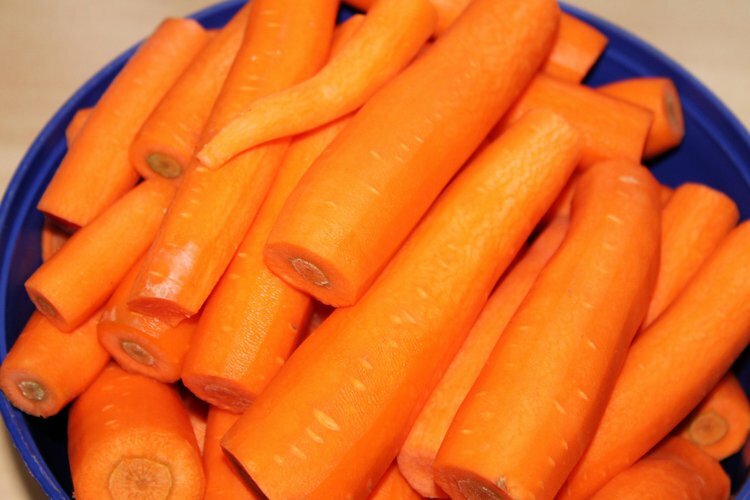 Carrots can help open the blood vessels and act as a vasodilator, with increased potassium amounts. Vasodilators increase blood flow, and thus, circulation in the body. This reduces the risk of many heart-related diseases like atherosclerosis, strokes, and heart attacks. Agte, V., Jahagirdar, M., & Chiplonkar, S. (2006). GLV supplements increased plasma β–carotene, vitamin C, zinc and hemoglobin in young healthy adults.European journal of nutrition, 45(1), 29-36. Gilani, A. H., Shaheen, F., Saeed, S. A., Bibi, S., Sadiq, M., & Faizi, S. (2000). Hypotensive action of coumarin glycosides from< i> Daucus carota</i>.Phytomedicine, 7(5), 423-426. Kidmose, U., Hansen, S. L., Christensen, L. P., Edelenbos, M., Larsen, E., & Nørbæk, R. (2004). Effects of genotype, root size, storage, and processing on bioactive compounds in organically grown carrots (Daucus carota L.). Journal of Food Science, 69(9), S388-S394. Surles, R. L., Weng, N., Simon, P. W., & Tanumihardjo, S. A. (2004). Carotenoid profiles and consumer sensory evaluation of specialty carrots (Daucus carota, L.) of various colors. Journal of agricultural and food chemistry,52(11), 3417-3421. Van Rooyen, J., Esterhuyse, A. J., Engelbrecht, A. M., & Du Toit, E. F. (2008). Health benefits of a natural carotenoid rich oil: a proposed mechanism of protection against ischaemia/reperfusion injury. Asia Pacific Journal of Clinical Nutrition, 17(S1), 316-319. Dutta, D., Chaudhuri, U. R., & Chakraborty, R. (2005). Structure, health benefits, antioxidant property and processing and storage of carotenoids.African Journal of Biotechnology, 4(13). Southon, S. (2000). Increased fruit and vegetable consumption within the EU: potential health benefits. Food Research International, 33(3), 211-217.